ICE (Inducer of CBF Expression) family genes play an important role in the regulation of cold tolerance pathways. In an earlier study, we isolated the gene CdICE1 from Chrysanthemum dichrum and demonstrated that freezing tolerance was enhanced by CdICE1 overexpression. Therefore, we sought to determine the mechanism by which ICE1 family genes participate in freezing tolerance. Using EMSA (Electrophoretic Mobility Shift Assay) and yeast one-hybrid assays, we confirmed that CdICE1 binds specifically to the MYC element in the CdDREBa promoter and activates transcription. 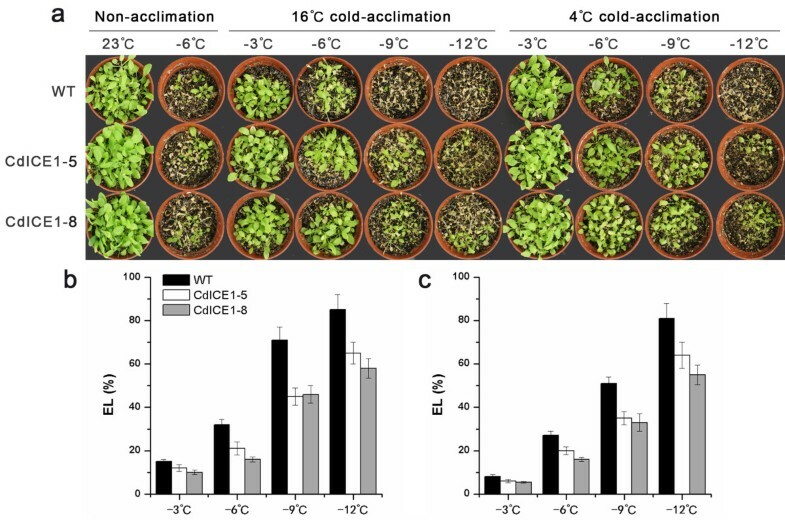 In addition, overexpression of CdICE1 enhanced Arabidopsis freezing tolerance after transition from 23°C to 4°C or 16°C. We found that after acclimation to 4°C, CdICE1, like Arabidopsis AtICE1, promoted expression of CBFs (CRT/DRE Binding Factor) and their genes downstream involved in freezing tolerance, including COR15a (Cold-Regulated 15a), COR6.6, and RD29a (Responsive to Dessication 29a). Interestingly, we observed that CdICE1-overexpressing plants experienced significant reduction in miR398. In addition, its target genes CSD1 (Copper/zinc Superoxide Dismutase 1) and CSD2 showed inducible expression under acclimation at 16°C, indicating that the miR398-CSD pathway was involved in the induction of freezing tolerance. Our data indicate that CdICE1-mediated freezing tolerance occurs via different pathways, involving either CBF or miR398, under acclimation at two different temperatures. Low temperatures adversely affect plant quality and productivity and function as a determinant of geographical distribution and growth [1–3]. Plants achieve cold tolerance following gradual exposure to low but non-freezing temperatures, a phenomenon called cold acclimation [4–6]. Cold acclimation is accompanied by changes at the physiological, molecular and biochemical levels [7, 8]. Low temperatures initiate signaling pathways that control the expression of genes encoding determinants necessary for chilling tolerance . Until now, the ICE1-CBF (Inducer of CBF Expression - CRT/DRE Binding Factor)-cold-response pathway has been one of the dominant cold signaling mechanisms mediating cold tolerance in Arabidopsis[1, 2, 9, 10]. Cold-regulated genes (COR) encode functional hydrophilic proteins, controlling cell osmoregulation and stabilization under freezing stress [11, 12]. DRE/CRT cis-elements containing the core sequence CCGAC have been identified from these COR promoters [13, 14]. Transcription factors known as CBFs (CRT binding factors) or DREB1s (DRE binding factors) induce transcription of downstream COR genes via interaction with DRE/CRT elements [15–17]. The genes encoding CBF transcription factors are up-regulated by cold. 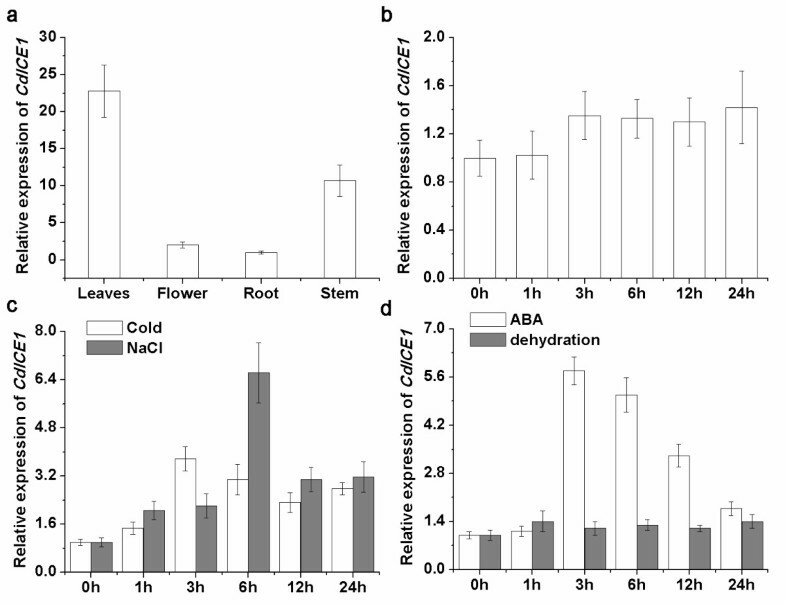 The three CBF genes encoding DREB1B/CBF1, DREB1A/CBF3, and DREB1C/CBF2 in Arabidopsis play a role in the cold acclimation pathway . Numerous reports have demonstrated that CBF overexpression alleviated damage associated with freezing stress in Arabidopsis, rice and non-model plants [15, 18, 19]. Several factors involved in regulation of CBF/DREB1 expression have been identified genetically in Arabidopsis. Direct regulators of CBF/DREB1 expression include HOS1 (high expression of osmotically responsive genes) , ICE1 (inducer of CBF/DREB1 expression 1)  and MYB15. The ICE1 gene encodes a MYC-like bHLH transcription factor that binds directly to canonical MYC cis-elements (CANNTG) in the CBF3/DREB1A promoter . ICE2 encodes a homolog of ICE1, and primarily influences the expression of CBF1/DREB1B but not that of CBF3/DREB1A. Overexpression of two ICEs has been associated with enhanced chilling tolerance in Arabidopsis, rice, apples and tobacco [1, 2, 22, 23]. 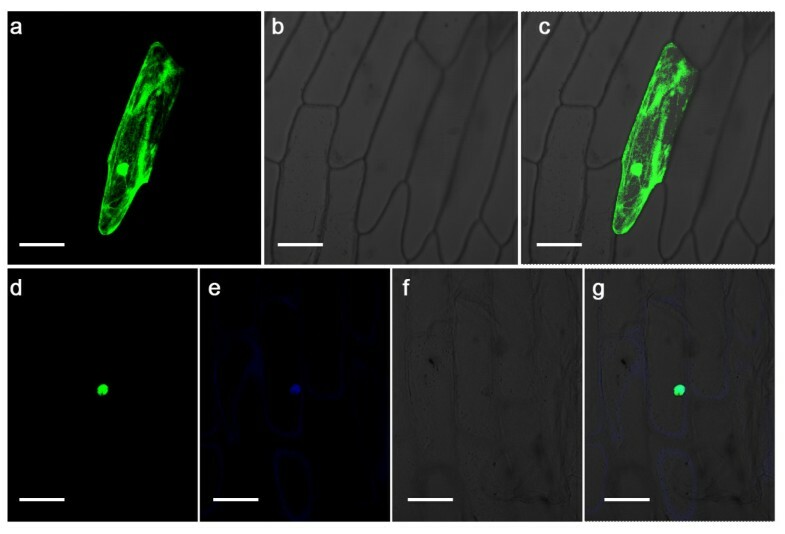 Interestingly, ICE1/SCREAM is also involved in stomatal differentiation, suggesting that ICE1 mediates transcriptional regulation of environmental adaptation and stomatal development in plants . In addition, protein interaction analysis reveals that ICE1 post-translational modification occurs during cold acclimation. Freezing tolerance is negatively regulated by HOS1-induced degradation of ICE1 and positively regulated by SIZ1-mediated sumoylation and stabilization of ICE1 [9, 10]. Recent data indicate that serine 403 of ICE1 plays a role in the regulation of transactivation and cold-induced degradation via the ubiquitin/26S proteasome pathway, which is probably mediated by HOS1 . Further investigation revealed that several jasmonate ZIM-domain (JAZ) proteins, the repressors of jasmonate signaling, physically interact with ICE1 and ICE2 transcription factors, decreasing the freezing stress response of Arabidopsis. MicroRNAs (miRNAs), a class of small non-protein coding RNAs containing 20 to 24 nucleotides (nt), have been increasingly investigated as key regulators of gene expression [27, 28]. Recent evidence indicates that plant miRNAs play a role in biotic and abiotic stress responses [29–31]. Cold-responsive miRNAs in different species enable development of breeding strategies for cold tolerance [30, 32–34]. The miR398 is a repressor of Cu-Zn superoxide dismutase genes (At1g08830, CSD1; At2g28190, CSD2), which act as reactive oxygen species (ROS) scavengers . MiR398 is regulated in response to oxidative stress, salt, abscisic acid (ABA), sucrose treatment and different ambient temperatures, resulting in an immediate change in CSD levels [35–40]. Over expression of CSD protects plants from oxidative stress and enhances freezing stress tolerance in transgenic plants . A recent report suggested that miR398-CSD positively regulated heat tolerance . The exact miR398-CSD pathway involved in the mechanism of freezing tolerance, however, is not completely understood. In a previous investigation of chrysanthemum freezing tolerance, we isolated CdICE1 from Chrysanthemum dichrum. In our present study, we further explored CdICE1 functions under two different cold acclimation conditions, which revealed that CdICE1 mediates freezing tolerance via CBF and miR398 pathways. A 1682-base pair promoter of CdICE1 was isolated using the TAIL-polymerase chain reaction (PCR) method, described in Chen . Its sequence including a few labeled stress-related cis-elements is shown in Additional file 1: Figure S1. Expression analysis of different tissues revealed its constitutive expression at different levels, with the strongest expression found in leaves and stems (Figure 1a). CdICE1 was significantly upregulated by cold, NaCl and ABA but not by dehydration (Figure 1). Under cold and ABA stress, CdICE1 expression increased gradually over the first three hours and then decreased slightly (Figure 1c, d). In addition, CdICE1 expression was induced under salt stress, with expression peaking at six hours and then declining gradually (Figure 1c). No apparent inducible expression of CdICE1 was detected with 20% polyethylene glycol (PEG) dehydration (Figure 1d). Quantitative reverse transcription PCR (qRT-PCR) analysis of CdICE1 expression in C. dichrum plants. (a) CdICE1 expression of different organs under non-stress conditions; (b) CdICE1 expression of leaves at different times under non-stress conditions; (c–d) CdICE1 expression of leaves under abiotic stress. Means and standard error calculated from triplicate assays. To explore the subcellular localization of CdICE1, we used a transient assay of CdICE1-GFP fusion constructs introduced into onion epidermal cells by particle bombardment. As shown in Figure 2, GFP alone resulted in diffused distribution of green fluorescence throughout the entire cell (Figure 2a-c). In contrast, CdICE1-GFP localized predominantly to the nucleus, which was further confirmed by 4',6-diamidino-2-phenylindole (DAPI) staining (Figure 2d-g). Subcellular localization of CdICE1 protein in onion epidermal cells. (a–c) Onion epidermal cells transformed with 35S::GFP as a control; (d–g) Onion epidermal cells transformed with 35S::CdICE1-GFP. Photographs were taken (a, d) under dark-field for green fluorescence; e (b, f) under bright-field for the morphology of the cells; (e, DAPI staining) under dark field for blue fluorescence; and (c, g) in combination. Bar = 50 μm. DAPI, 4',6-diamidino-2-phenylindole. To determine whether CdICE1 binds to MYC recognition sites in the CdDREBa promoter, CdICE1-His fusion protein was expressed and purified from Pichia pastoris (Figure 3a). MYC-WT sequences were used to determine the interaction with His–ICE1 in an electrophoretic mobility shift assay (EMSA). The results showed that the complex between CdICE1 and MYC-WT was inhibited by the MYC-WT competitor, but not by a mutated competitor (MYC-M) (Figure 3b), implying a specific interaction between CdICE1 and MYC elements. Eukaryotic expression and EMSA assays of CdICE1 and transcriptional activation assays. (a) Eukaryotic expression of CdICE1 and purification using His-tag; (b) Binding assays between CdICE1 protein and MYC elements: purified protein was incubated with 50 ng of biotin-labeled probe. Non-labeled probe with different concentrations (50, 100, and 500 times) was added; (c) Fragment constructs derived from different N’-deletions of amino acids; (d) Transcriptional activation assays of CdICE1 via yeast one-hybrid assays. EMSA, electrophoretic mobility shift assay. A yeast one-hybrid system was used to investigate CdICE1 transcriptional activity. Yeast cells harboring pCL1, pGBKT7-CdICE1 or pGBKT7-CdICE1-21 proliferated on SD/His-Ade- medium and X-α-gal activity was detected based on blue coloration, unlike pGBKT7, pGBKT7-CdICE1-85 or pGBKT7-CdICE1-121 (Figure 3c-f). The data confirmed that CdICE1 was associated with transactivation activity, suggesting that N’ 22–85 amino acids may be required for transactivation. Transgene overexpression was detected using genomic DNA PCR and mRNA quantitative reverse transcription PCR (qRT-PCR) assays (see Additional file 2: Figure S2) in transgenic plants but not wild-type (WT) Arabidopsis. Independent T3 homozygous transformants CdICE1-5 and CdICE1-8 were used for further experiments in freezing tolerance. After freezing treatments (−6°C), no significant differences in electrolyte leakage (EL) or survival rate were observed between transgenic and non-transgenic plants that were not initially subjected to acclimation (Figure 4). In both transgenic and WT plants, 4°C or 16°C temperature acclimation enhanced freezing tolerance, but plants overexpressing CdICE1 showed higher survival rates after recovery and lower EL than WT ones under both freezing treatments (Figure 4). These data indicate that CdICE1 plays an important role in cold acclimation-mediated freezing tolerance. Overexpression of CdICE1 in Arabidopsis improves freezing tolerance. (a) Freeze-treated Arabidopsis after 21-day recovery growth; (b) Electrolyte leakage of Arabidopsis leaves under different freezing treatments after acclimation at 16°C; (c) Electrolyte leakage of Arabidopsis leaves under different freezing treatments after acclimation at 4°C. Downstream genes of CdICE1 were further tested using qRT-PCR to determine changes in freezing tolerance in transgenic Arabidopsis. Acclimation at 16°C did not affect expression of the three CBF genes compared with their levels at 23°C. CdICE1 overexpression did not alter the transcription of CBF1 or 2 but there was a slight increase in CBF3 (Figure 5a,c,e). Acclimation at 4°C induced their expression, with transgenic plants showing higher CBF expression than WT plants (Figure 5b,d,f). In two transgenic plants, CBF3 expression was higher compared with the other two genes (Figure 5d,f). Expression of the three COR genes was also significantly higher in CdICE1-overexpressing lines compared with WT plants undergoing acclimation at 16°C or 4°C (Figure 6). These data indicate that during acclimation at 4°C, CdICE1 mediates freezing tolerance via a CBF-COR pathway, consistent with a previous report . Acclimation at 16°C was associated with an improved mechanism of CdICE1 to freezing tolerance inconsistent with acclimation at 4°C. Quantitative reverse transcription PCR (qRT-PCR) analysis of CBFs between WT and transgenic Arabidopsis plants. (a, c, e): CBF1-3 mRNA expression levels during acclimation at 16°C; (b, d, f): CBF1-3 mRNA expression levels during acclimation at 4°C. WT, wild type. Quantitative reverse transcription PCR (qRT-PCR) analysis of downstream freezing-tolerance genes CORs and RD29a between WT and transgenic Arabidopsis plants. (a, c, e): mRNA expression levels at 16°C; (b, d, f): mRNA expression levels under conditions below 4°C. WT, wild type. To further explore the regulatory mechanism of acclimation to 16°C that induces freezing tolerance in transgenic Arabidopsis, miR398 and CSD expression levels were studied. In WT plants, miR398 expression was downregulated twofold during acclimation at 16°C for 24 hours, while no changes occurred under 4°C (Figure 7a). The downregulation due to silencing of all three MIR398 loci was further examined. RT-PCR showed that primary MIR398b (c) exhibited significant decreases and no alteration in primary MIR398a expression at 16°C (Figure 7c). The two target genes CSD1 and CSD2 were upregulated 1.5- and 2.1-fold, respectively, after 24 hours at 16°C (Figure 7b). Quantitative reverse transcription PCR (qRT-PCR) analysis and comparison of freezing tolerance between WT and mutant Arabidopsis . (a) matured miR398 expression under acclimation at 16°C and 4°C; (b) CSD1 and CSD2 expression at 16°C; (c) qRT-PCR analysis of primary transcript MIR398 a, b and c during acclimation at 16°C; (d) RT-PCR analysis of expression of MIR398c, CSD1 and CSD2 between WT Arabidopsis and the mutants; (e) Arabidopsis treated at −9°C after 21 days of recovery growth following 16°C/4°C/non-acclimation conditions; (f) Electrolyte leakage (EL) of Arabidopsis leaves at 1 hour after treatment at −9°C. WT, wild type. To elucidate the association of miR398-CSDs with freezing tolerance, we examined phenotypes of growth recovery after freezing treatment in the three Arabidopsis mutants mir398c, csd1, and csd2 (Figure 7d-f). After freezing treatment, mir398c mutants exhibited higher survival rates, whereas csd1 and csd2 showed lower survival compared with WT plants. Freezing tolerance of mir398c, csd1 and csd2 was induced at 4°C/16°C compared with the non-acclimatized plants (Figure 7e). The EL values in mir398c were always lower while those in csd1 and csd2 were higher than the WT plants (Figure 7f). Expression levels of CSD1 and CSD2 were much higher in mir398c mutants compared with WT plants (Figure 8a). Under non-acclimatized conditions, CdICE1-overexpressing plants were no different than WT with respect to expression of miR398 and its two target genes CSD1 and CSD2 (Figure 8a). After 24 hours of acclimation at 16°C, however, miR398, MIR398b and MIR398c in transgenic plants was downregulated compared with WT, and CSD1 and CSD2 were upregulated (Figure 8a). The freezing tolerance of CdICE1-8/mir398c plants (a cross between CdICE1-overexpressing plants and mir398c) was higher than mir398c after acclimation at 16°C (Figure 8b), which may partially result from primary MIR398b reduction by CdICE1. Expression and freezing tolerance analysis. (a) RT-PCR analysis of miR398, MIR398a, b, c, CSD1, and CSD2 of WT, CdICE1 transgenic Arabidopsis and crossing materials CdICE1-8/ mir398c; (b) freezing tolerance of WT, mir398c mutant and CdICE1-8/mir398c after acclimation at 16°C. WT, wild type. The CdICE1 gene isolated from C. dichrum encodes a bHLH protein with an amino acid sequence highly similar to that of Arabidopsis ICE1 and ICE2. Its over-expression increases tolerance to low temperature, drought and salinity stress in chrysanthemum . However, the molecular mechanism underlying freezing tolerance is not well understood. In this study, CdICE1 expression was induced by cold, salt and ABA, and its nuclear location was confirmed by subcellular localization in vivo. BHLH proteins regulate downstream genes through sequence-specific interactions in the promoter regions [2, 44]. In Arabidopsis and wheat, ICE1 acts directly upstream of CBFs by binding to the MYC recognition sites present in CBF gene promoters, and then subsequently triggers expression of CBF/DREB regulons [1, 45]. Based on EMSA in the current study, the CdICE1 protein was found to bind to the MYC recognition site of the CdDREBa promoter. Overexpression of CdDREBa has been previously observed to improve drought and salinity stress tolerance in chrysanthemums . In our study, CdICE1 protein also showed transactivation activity. These results indicate that an ICE1-DREB pathway exists in C. dichrum and that CdICE1 might be a useful transcription factor in chrysanthemum breeding for improvement of stress tolerance. The CBF cold-responsive pathway is an important cold-acclimation gene network that contributes to cold tolerance [15, 17, 19, 47]. A dominant mutation in ICE1 blocks cold induction of the CBF3 regulon and impairs freezing tolerance . In contrast, ICE1 overexpression increases cold tolerance relative to WT plants not only in Arabidopsis but also in rice and apples [1, 2, 23, 48]. In this study, CdICE1 overexpression resulted in elevated expression of CBF and three COR genes during 4°C cold acclimation and enhanced tolerance to freezing stress. These data suggest that CdICE1 acts as a signal transduction component in the CBF pathway and is associated with cold tolerance, similar to ICE genes in Arabidopsis and wheat [1, 45]. After the discovery of miRNAs, researchers recognized the important role of these small RNAs in abiotic stress response via posttranscriptional gene regulation [35, 49]. In Chinese cabbage (Brassica rapa), extremely high temperature (46°C) reduces the miR398 level . The expression of miR398 was also steadily decreased over 48 hours under salt stress in Arabidopsis. 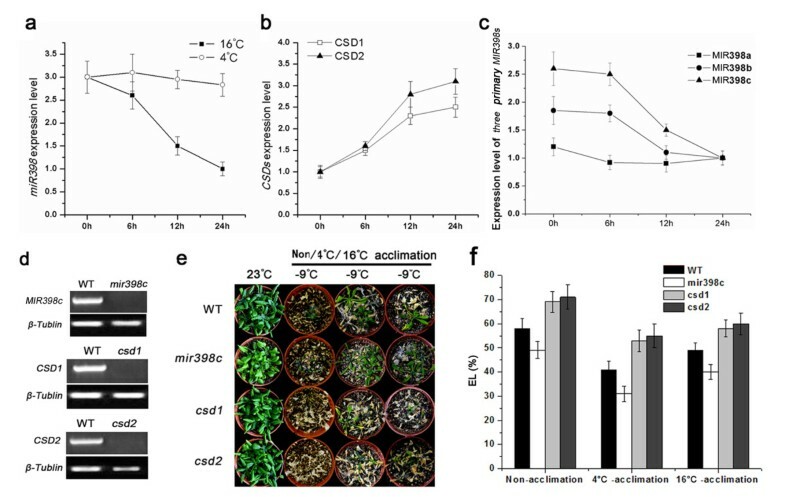 Our study found that the downregulation of miR398 is involved in changes associated with a 23°C to 16°C temperature shift (Figure 7c), which is consistent with a previous report suggesting that the expression of miR398 was significantly lower under ambient temperature (16°C) than at 23°C in Arabidopsis. It has been shown that expression of MYB, WRKY and bHLH family genes is regulated by ICE1 in Arabidopsis. Cis-elements such as MYB, WRKY or bHLH transcription factor-binding elements were predicted in MIR398b and MIR398c promoters (see Additional file 3: Figure S3). Therefore, we propose that CdICE1 decreased the miR398 level via ICE1-dependent Transcription factors (such as MYB, WRKY or bHLH) that act as repressors of pri-miR398b (c). In Arabidopsis, miR398-CSDs were found to participate in regulation of biotic stress (due to Pseudomonas syringae) and abiotic stresses such as Cu2+, UV, ozone, salt, ABA and heat [35, 37, 38, 41]. Transgenic Arabidopsis plants overexpressing a miR398-resistant form of CSD2 accumulate more CSD2 mRNA than plants overexpressing a regular CSD2. The transgenic plants were more tolerant to increased radiation, heavy metals and other oxidative stresses . In this study, the downregulated expression of miR398 at 16°C induced expression of two CSD genes (Figures 7c and 8a). Freezing tolerance was negatively regulated by miR398 levels and improved by CSD genes, consistent with a previous study demonstrating that CSD overexpression elevated the freezing tolerance of alfalfa . CdICE1-overexpressing plants induced higher ROS content compared with WT plants during the initial stages (6 hours and 12 hours) of acclimation to 16°C, while no significant difference in ROS levels was observed between WT and transgenic plants after 24 hours at 16°C (see Additional file 4: Figure S4). We speculate that early induction of ROS might act as a signal to reduce miR398 expression in response to acclimation at 16°C. The reduction in miR398 in turn increased the expression of CDS1 and CSD2 that eliminated the ROS with similar ROS levels between WT plants and CdICE1-overexpressing plants after 24 hours at 16°C (see Additional file 4: Figure S4). In addition, freezing tolerance assays of WT, mir398c mutant and CdICE1/mir398c (a cross of CdICE1 overexpressing plants with mir398c mutant) at 16°C showed that CdICE1/mir398c plants were more tolerant compared with the mir398c mutant (Figure 8b), suggesting that down regulation of MIR398c was one of the ICE1-regulated pathways. Taken together, overexpression of CdICE1 resulted in a decrease in miR398 expression levels following transition from 23°C to 16°C, indicating that CdICE1 induced freezing tolerance partially via the miR398-CSD pathway. The different alterations in ambient temperature resulted in improvement in freezing tolerance. Upon transition from 23°C to 4°C, the ICE family genes played an important role in inducing the expression of CBF genes, consistent with past results. However, interesting data showed that CdICE1 from C. dichrum regulated freezing tolerance of Arabidopsis partly through the miR398-CSD pathway following transition from 23°C to 16°C. C. dichrum plants were obtained from the Chrysanthemum Germplasm Resource Preserving Centre, Nanjing Agricultural University, China. We subjected three-week-old seedlings of C. dichrum to varying durations of abiotic stress treatments, including 200 mM NaCl, 20% PEG, 100 μM ABA and 4°C temperature, to analyze the expression pattern. A pEarleyGate103-CdICE1 expression plasmid was introduced into Agrobacterium tumefaciens strain EHA105 and used for transgenic measurements in Arabidopsis ecotype Columbia using the floral dip method [51, 52]. Arabidopsis mutants mir398c (SALK_038698C), csd1 (SALK_024857C), and csd2 (SALK_041901C) were obtained from the Arabidopsis Biological Resource Center (Columbus, OH, USA). We obtained the CdICE1-overexpressing Arabidopsis T3 plants (CdICE1-5 and CdICE1-8) and CdICE1-8/mir398c plants by crossing CdICE1-8 T3 plants with mir398c (SALK_038698C). Arabidopsis plants were grown in soil at 23°C and 70% relative humidity under 24-hour constant light (100 μmol m-2 sec-1) for 15 days. The plants were then shifted to either 4°C or 16°C for 24 hours followed by freezing at -3, -6, -9 or -12°C for 1 hour. After freezing treatment, plants were incubated at 4°C for 1 day and then returned to 23°C. EL from leaves was assayed and survival rate was determined 21 days later. The full-length coding region of CdICE1 was fused to the N-terminus of a green fluorescent protein (GFP) gene under the control of a CaMV 35S promoter. The CdICE1 open reading frame (ORF) fragment harboring BamHI and SmaI enzyme sites was amplified with the primer pair CdICE1-B/CdICE1-S (Table 1). Following purification, the resulting PCR product was cut by BamHI and SmaI and ligated to the same cleavage site on pBI121-GFP using T4 DNA ligase. Plasmid DNA pBI121-CdICE1-GFP was transiently introduced into onion epidermal cells using a helium-driven particle accelerator (PDS-1000; Bio-Rad; Hercules; California; USA). An empty vector with GFP (pBI121-GFP) was transformed into another set of epidermal cells as a control. After bombardment, onion peels were kept on MS plates in the dark for 16 hours. Confocal laser microscopy (Leica SP2) was used to monitor GFP expression. Primers zh-F and zh-R (Table 1), containing KpnI and SacII restriction sites, were used to amplify the CdICE1 ORF. After digestion with KpnI and SacII, the amplified fragment was inserted into the expression vector pPICZαA (Invitrogen, Carlsbad, California, USA). The resulting expression vector was transformed into the yeast strain X33 following digestion with SacI. The CdICE1 protein was prepared according to the manufacturer’s instructions. EMSA was carried out using a LightShift Chemiluminescent EMSA kit (HyClone-PIERCE, Rockford, Illinois, USA). The double-stranded oligonucleotides MYC-WT (CGCTCTTCACATGCGGCATC) from the CdDREBa promoter and mutated MYC-M (CGCTCTTACCAGTCGGCATC) were used as probes and competitors for the EMSA. Four different N’-deletion variants of the CdICE1 coding region were amplified using forward primers ICE1, ICE21, ICE85 or ICE121 and reverse primer ICE471 (Table 1). The resulting fragments were inserted into the NdeI/BamHI cloning site of the yeast expression vector pGBKT7 to produce pGBKT7-CdICE1, pGBKT7-CdICE1-21, pGBKT7-CdICE1-85 and pGBKT7-CdICE1-121 (Figure 4). Each of these constructs, pCL1 (positive control) and pGBKT7 (negative control) were individually introduced into separate cultures of Saccharomyces cereviseae strain Y2H Gold (Clontech, Mountain View, California, USA) following the manufacturer’s protocol. Selection of transformants carrying either pGBKT7-CdICE1/-21/-85/-121 or pGBKT7 was carried out on SD/-Trp medium. The pCL1 transformants were selected on SD/Leu- medium. All six transformant cell lines were then transferred to an SD/His-Ade- and SD/X-α-gal medium to observe cell growth. Total RNA was extracted from C. dichrum and Arabidopsis using a plant RNAiso plus kit (Takara, Otsu, Japan), followed by RNase-free DNase I treatment to remove genomic DNA. First-strand cDNA synthesis from 1 μg total RNA of C. dichrum was accomplished by reverse transcription using SuperScript III reverse transcriptase (Invitrogen). Arabidopsis RNA was synthesized to cDNA with a One Step PrimeScript miRNA cDNA synthesis kit (Takara). To determine the transcription levels of different genes, a SYBR Green PCR kit (TOYOBO, Osaka, Japan) was employed along with the gene specific primers listed in Table 1. Transcription levels of either EF1α (C. dichrum translation elongation factor gene) or β-tubulin (Arabidopsis) were used as internal references. Matured miR398 expression levels were assayed with the specific primers miR398-F/Uni-miR qPCR primer compared with the reference gene U6 (primer U6-F/-R). PCRs were conducted according to the following protocol: 60 seconds denaturation at 95°C, 30 seconds annealing at 55°C and 30 seconds elongation at 72°C for 40 cycles. RT-PCR conditions for primary MIR398b and MIR398c transcript amplification followed the method described by Sunkar . Briefly, the PCR conditions included: 95°C for 15 minutes, 30 seconds denaturation at 94°C, 30 seconds annealing at 60°C and 2 minutes elongation at 72°C for 35 cycles, 72°C for 10 minutes. RT-PCR conditions for MIR398a, CSD1 and CSD2 amplification were similar to MIR398b and MIR398c except that PCR cycles were 50, 30 and 30, respectively. Three replicates of each reaction were performed. The data were analyzed by Bio-Rad iQ5 Optical System Software v1.0. Superoxide anion production was measured following the method of Frahry  and the content of H2O2 was determined, according to Bellincampi . Yu Chen, Jiafu Jiang contributed equally to this work. This work was supported by funding from the Program for New Century Excellent Talents in the University of Chinese Ministry of Education (NCET-10-0492, NCET-12-0890, NCET-11-0669), the National Natural Science Foundation of China (31071825, 31272196, 31171987), the Natural Science Fund of Jiangsu Province (BK201164, BK2012773), 948 Project of Ministry of Agriculture (2011-G17, 2013-S13), Fund for Independent Innovation of Agricultural Sciences in Jiangsu Province [CX (12)2020], the Program for Hi-Tech Research, Jiangsu, China, (BE2012350, BE2011325), Fundamental Research Funds for the Central Universities (KYZ201147, KYZ201112) and the Youth Science and Technology Innovation Fund from Nanjing Agricultural University (KJ2011009). YC, JJ and FC conceived the study and designed the experiments. YC, AS, SC, HS and LZ performed the experiments. YC, HL, CG and JS analyzed the data with suggestions by JJ, FC and WF. YC and JJ wrote the manuscript. All authors read and approved the final manuscript.